Barefoot and Bluejeans | Welcome to my life! While wasting time on Pinterest the other day I stumbled across a 30 Day Challenge of prompts/topics for your blog. Since this blog is new, and since I’m not yet sure which direction it is going to take, I figured I would give it a try, along with the 30 Day Ab Challenge, 30 Day Arm Challenge, and 30 Day Squat Challenge. I know, that’s a lot of challenges to take on all at once, but I really want to post regularly on this blog, and I really really want to be in good shape for my wedding which just so happens to be in less than 4 months! Today’s prompt is: Write some basic things about yourself. Hmmm. Well, for starters, I am madly in love with Mr. M. We have many fur babies…2 indoor cats (KittKatt and Lily), 1 outdoor cat (Jerry), 1 outdoor dog (Case), and 3 horses (CeeCee, Cosmo, and Skeeter). They keep us very, very busy. KittKatt rules our house with an iron fist paw. She demands her food bowl be refilled before it is even empty, God forbid she have to eat stale crumbs. She won’t use a cat pan with a lid, she will pee in front of it over and over again until you get the hint and go back to a basic cat pan. She is a pillow hog and if you try to reclaim it, she will bite. But this isn’t about her, so some more about me. I have a tremendous love for cooking, but hate cleaning up the kitchen afterwards. I like making healthy foods made from fresh ingredients. I’m not a fan of processed foods (usually). I am a caffeine addict. I love iced coffee in the summer and hot tea, well any time. I have a passion for country music. I am also a fan of classic rock and alternative rock, no hard rock for me. It’s scary. No rap, it’s disgusting. That’s my opinion, you don’t have to agree with me. I am very opinionated but also very indecisive. I love fishing and hunting. I killed my first buck this year! I don’t care for shopping, it frustrates me. I love 4 wheel drive trucks and will have one of my own someday. In the meantime, my jeep will do just fine. I think that’s enough about me for now. 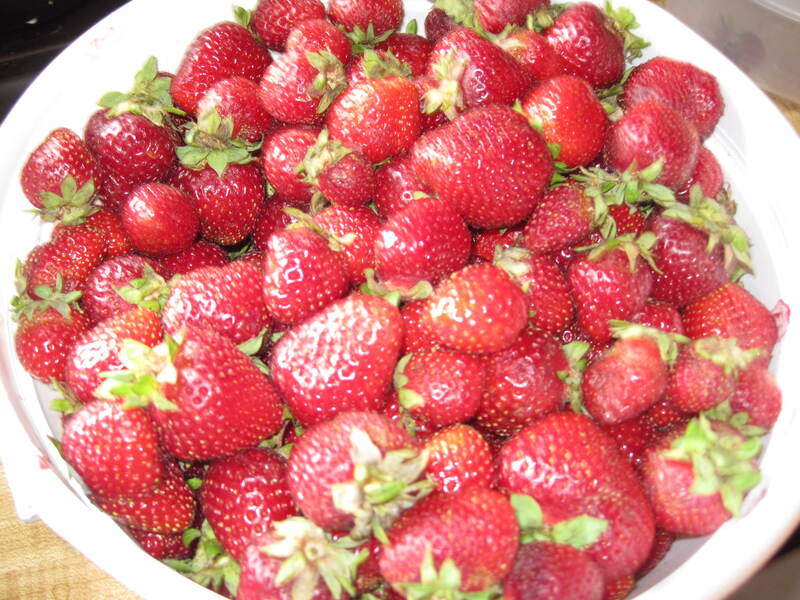 About the only thing I truly love about the warmer months here in the South are the fresh strawberries and blueberries. It’s not the heat that I can’t stand, it’s the humidity. Something about breaking a sweat by 7 a.m. when all you have done is walked out your front door just rubs me wrong. Plus the pollen really gets my allergies going and makes it impossible to sleep some nights. Dry heat and I get along just fine. But since there is no escaping the humidity this time of year, what better way to overcome it than with some fresh, juicy, sweet strawberries? I had been meaning to stop and get a couple gallons of berries for several weeks now but just never found the time. Mr. M actually likes going to pick them ourselves, but when you can buy them pre-picked for 50 cents more, and you’re as busy as we are, then that’s what you do! I picked these beauties up the other day and decided to try my hand at making some strawberry jam. I’m not much of a jam fan, I don’t care for how sweet and sticky it is, but Mr. M loves jam. So naturally, like the good future Mrs. M that I am, I decided to make a batch just for him. I know, I’m sweet 🙂 But when looking for a recipe, I had trouble finding one that does not use pectin. 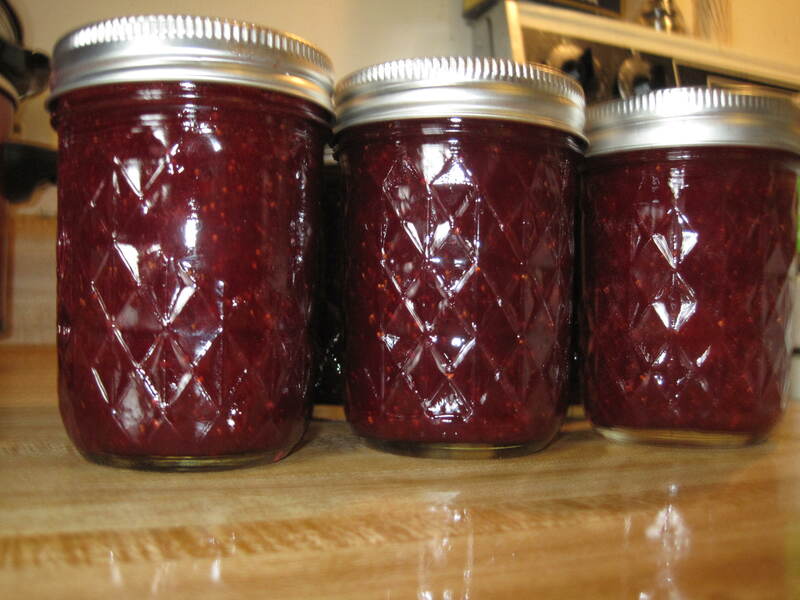 I wanted our jam to be as free from chemicals and processed food as possible. Obviously it has sugar in it, and I realize that I could have used a natural sweetener or used honey, but we are on a budget and I just couldn’t see parting with over 3 cups of my cherished local honey for a batch of jam. Those of you who buy local honey know why it could be hard to part with this much, the stuff is not cheap! So sugar it is. 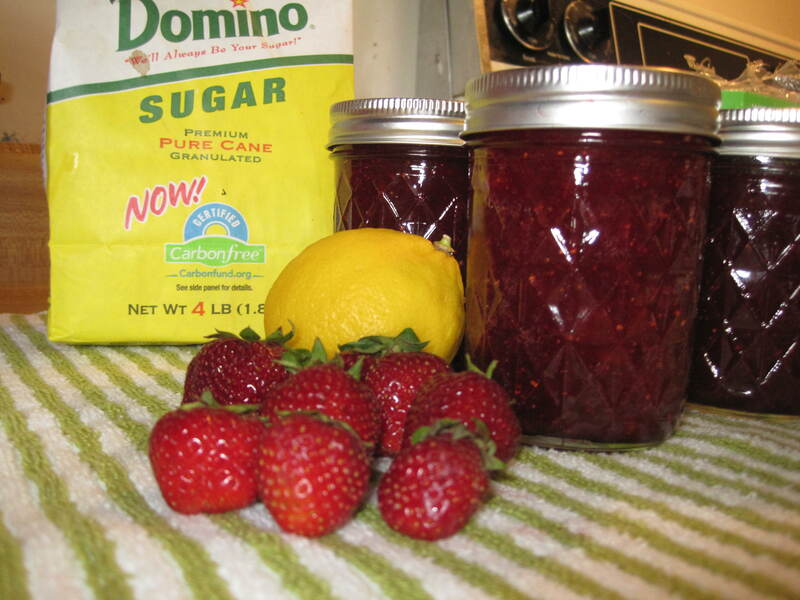 I got this recipe for Strawberry Freezer Jam from my grandmother. After you get your berries all washed up, cut the tops off and cut them in half. You will need 4 cups of mashed berries for this recipe. I don’t have a potato masher so it took me a while to mash them up with a spoon. I would have used my food processer to help, but it is really small and would have taken a while too. Plus I completely forgot I had it until I started writing this post! 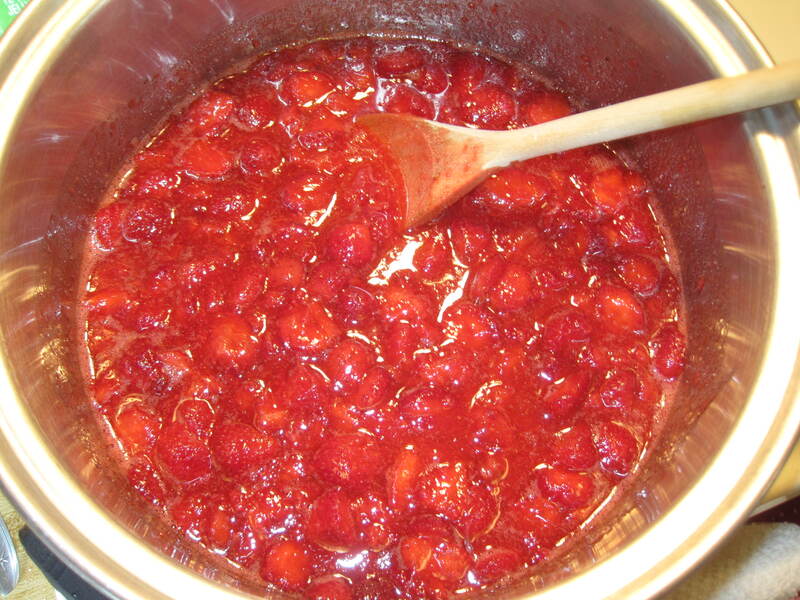 Once your berries are all mashed up, add 4 cups of sugar, and 1/4 cup of lemon juice. I always use fresh lemon juice, I don’t like the taste of the bottled kind. Heat this in a saucepan over medium-low heat until all of that sugar is dissolved. Once the sugar is dissolved, crank up the heat to high and let it come to a rolling boil. Make sure you stir it pretty often. You will need to use a candy thermometer to make sure it reaches 220 degrees F.
Wash and cut the tops off the strawberries. Mash them in a large bowl, making sure you have 4 cups once they are mashed. Add to a large saucepan. Add 4 cups of sugar and 1/4 cup lemon juice. Heat over medium-low, stirring, until sugar is dissolved. Increase heat to high and bring to rolling boil, stirring occasionally. 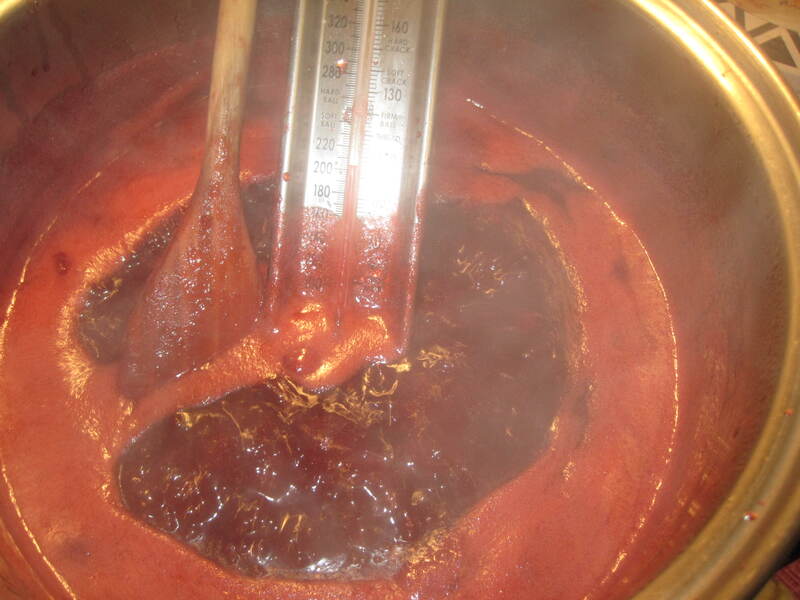 Using a candy thermometer, make sure mixture reaches 220 degrees F. Ladle into hot, sterilized jars. Place in refrigerator for 2 hours before freezing. Yield: just over 6 of the 8 ounce jelly jars. Mr. M was born and raised in Fayetteville, TN, or Lincoln County as everyone refers to it. He spent his entire life in one house right next door to his grandparents. He never really ventured out of Lincoln County other than for highschool baseball games and a trip to Gulf Shores when he was really young. I think he probably assumed he would marry a girl from here and they would raise their family in the same way he grew up. Boy was he wrong. My dad was in the military during my entire childhood. I didn’t really have much of a response when people asked where I was from. I would respond with “well, a lot of places.” At the time I really wished for nothing more than to be able to have a place to call “home” and to set down some roots and make lasting friendships. Now, I am glad I had the chance to live so many places as it has opened my eyes to the world. Nine years ago my family moved from Texas to Tennessee. I was a junior in high school. I had to leave all my high school friends behind. I had to leave everything I loved about Texas behind. I was devastated. And since I was a teenage girl, there is no doubt that I was a bit dramatic about it all. Shortly after moving to Lincoln County I decided to get involved in the FFA chapter at the high school. I was in FFA and 4-H in Texas and really enjoyed it. I had spent years competing in horse judging. That fall I joined the team at the high school. During our first practice, we were watching a video when this really country guy busts into the middle of the meeting, sits down next to one of the guys on the team, and proceeds to tell him about his “hot new girlfriend”. I just rolled my eyes and continued watching the video. During the next several practices, that guy with the hot girlfirend would come sit next to me and ask me to help him with his judging. He had some talent, but the boy could not give reasons- a hig part of horse judging. He was so nice that I couldn’t help but agree to help him. Long story short, over the next several months we became really close friends and even helped each other through some relationships. I wasn’t initially attracted to him since he wasn’t my “type” at the time. Eventually our friendship turned to flirting, and one day after school he asked “so like, are we dating?” and I said sure, why not. He was my best friend so why not give it a try.